Amid Trump Defense Spending Statements, His Plans Are Unclear : Parallels As President-elect Donald Trump tweets about expanding nuclear security and the cost of combat aircraft, some wonder whether his hardball posts are just "Art of the Deal" tactics to help the Pentagon. A Marine Fighter Attack Squadron 121 F-35B Lightning II prepares to make a vertical landing in Yuma, Ariz., in 2013. President-elect Donald Trump asked Boeing to price a version of one of its fighter jets to be competitive with Lockheed Martin's F-35 aircraft. Washington's national security establishment is not used to this kind of spotlight. From time to time, the players in what Sen. John McCain calls the "military-industrial-congressional complex" are hailed as heroes, praised for their sacrifice or occasionally dinged in committee testimony and the odd think tank white paper. Mostly, however, the defense world tends to operate in locked rooms, out of sight from nearly everyone but lobbyists and trade reporters. But now, President-elect Donald Trump propels once-arcane national security particulars onto news homepages and to the top of the hourly news headlines. In the past day, he blasted updates to his nearly 18 million Twitter followers about his outrage over the cost of the Pentagon's combat aircraft and his desire to "greatly strengthen and expand its nuclear capability." If many Americans didn't know before about the Defense Department's struggle to field its advanced new single-seat fighter, the F-35 Lightning II, they do now. And if Americans thought the dilemma of nuclear weapons — or strategic competition with Russia — were byproducts of Cold War nostalgia, they may be thinking again. "Let it be an arms race," Trump declared on MSNBC Friday, following up on his Twitter post. "We will outmatch them at every pass and outlast them all." Trump aides are all over the map about what the president-elect's nuclear comments meant. Different spokesmen offered different takes — one that Trump was warning about the danger of nuclear proliferation, another that Trump was resolute about maintaining America's nuclear arsenal in case other nations strengthened theirs. It's also possible that by calling for "expanded capability," Trump was simply endorsing the program he'll inherit from President Barack Obama, in which the U.S. is on track to spend around $1 trillion in the next 30 years on new nuclear submarines, bombers and missiles. Before his nuclear tweet, Trump posted that he was pitting two aerospace arch-nemeses against each other. "Based on the tremendous cost and cost overruns of the Lockheed Martin F-35, I have asked Boeing to price-out a comparable F-18 Super Hornet!" he tweeted Thursday. In January, the Pentagon asked Congress for more than $10 billion for 63 F-35s – 43 Air Force models, 16 for the Marine Corps and four for the Navy, which works out to nearly $160 million per jet. Lockheed Martin says as volumes increase, its goal is to get the cost per aircraft down to about $85 million by 2020. Boeing's Super Hornet — which is less sophisticated, has been in production for much longer and is nearing the end of its planned run — today costs around $70 million per copy. 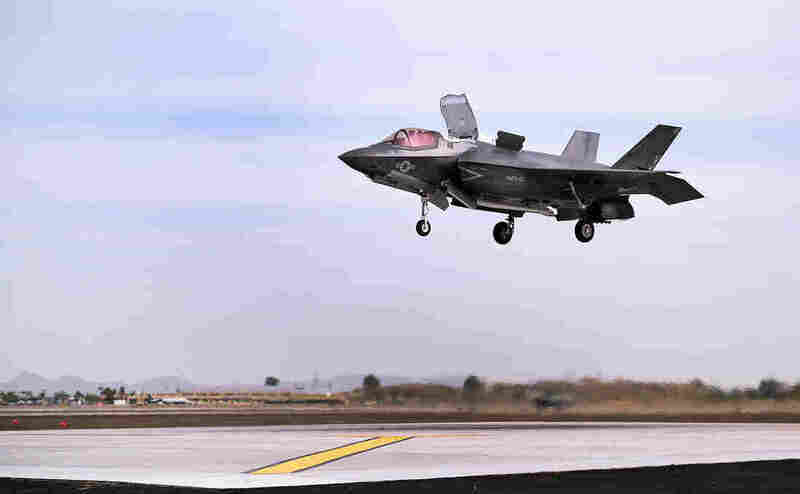 Thursday's tweet was only the most recent time Trump has attacked the F-35, which is both the world's most sophisticated new combat aircraft and the costliest weapons program in history. But it is the first time that an incoming president has consistently picked out such a precise target for cost-cutting so early – and it's quite a whipsaw from Trump's previous promises of billions of dollars in new defense spending. The Pentagon would get "the best" military equipment, Trump promised earlier this month in Fayetteville, N.C. – "new, modern [and] clean." Advocates would call the F-35 "the best" — and point out that it began as an attempt by the Pentagon to cut costs. Rather than build three separate new aircraft for the Air Force, Navy and Marine Corps, the Defense Department decided during the Clinton administration to buy one model that could be customized for each, plus many international militaries. Program leaders also thought they could get the jets into service more quickly by putting it into production at the same time they were developing and testing it. The F-35 was designed from its wheels up to evade enemy detection, incorporate the latest electronic sensors and talk seamlessly with other aircraft, satellites and units on the battlefield. And although the Pentagon still insists it's getting a world-beating new weapon, its bets failed in terms of saving money or time. The Marine Corps and Air Force had to delay by years the point at which the first small numbers of aircraft would be ready for service, and all the jets are waiting for more software upgrades that will enable them to take the full range of tasks for which they were designed. That's why the F-35 is a favorite target of acquisition critics such as McCain. Skeptics also swoon over the estimates of more than $1 trillion it will cost to buy and operate the jets over the next three decades, and complain about the compromises necessary to make a one-size-fits-all airplane. Boeing's older-model, the F/A-18 Super Hornet — the one Trump has requested it to price out — is the U.S. Navy's workhorse today but does not incorporate the built-in refinements or stealth features of the newer jet. It's cheaper, however, and Boeing has spent the past several years making the case to U.S. and other buyers that it's a great bargain. Without more orders, company leaders warn they'll have to shut down their St. Louis production line, costing thousands of jobs. Boeing, which lost the competition that Lockheed won to build the F-35, has had success nipping at Lockheed's heels. Australia and Canada both have ordered batches of Boeing-built Super Hornets to tide them over while waiting for F-35s or to serve as a less expensive replacement. Boeing said in a tweet of its own that it was "ready to work with Trump's administration to affordably meet U.S. military requirements." Lockheed, meanwhile, says it's reducing the cost per F-35 so it eventually will be comparable with older-model fighters. Defense insiders wonder whether Trump's hardball posts may be "Art of the Deal" tactics to help the Pentagon as it negotiates with Lockheed Martin for future batches of aircraft. Cancelling the F-35 outright would be a titanic decision. It would mean, among other things, the U.S. Marine Corps and other key allies, including the United Kingdom and Italy, would have no new, fast combat jets to operate at sea. But the political strengths of the F-35 that have ensured its survival this long present a major challenge to any attempt at actually cutting the program. Lockheed sources components for the aircraft in 45 states and Puerto Rico, and says it's responsible for 146,000 direct and indirect jobs. So far, it has had broad support in Congress. And substituting older-model jets for advanced aircraft just to save money would be a huge step backward and might endanger U.S. troops, advocates argue. "Trump's impulsive tweeting about subjects he does not understand threatens to erode his credibility before he is even inaugurated," warned defense consultant Loren Thompson, a well-known voice for the aerospace industry. In threatening the F-35, "Trump is cutting to the heart of future U.S. military capabilities." A previous version of this story incorrectly stated Lockheed Martin's goal on cost per aircraft. The correct number is $85 million, not $85 billion.